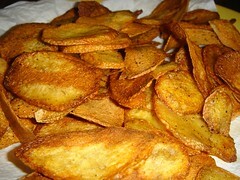 Anong binatbat ng “Lay’s” at “Ruffles” dito! Haha! 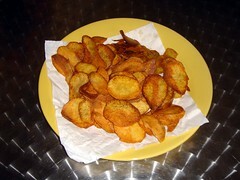 My wife decided to fry some homemade potato chips sprinkled with salt and cracked pepper… she did it on a whim and *tada*… delicious, scrumptious, crispy, crunchy, snacks ready to be devoured! The only thing missing is the television set in front of me and a couple of good DVD movies to go along with the golden delights! Haha… but it won’t be for long! … now where did I put that remote?! Aw man, not again with that 8 random things about me. anyway hehehe Have you seen this news?? Are you a da vinci freak? I’m not a da vinci freak but the latest news about the last supper even has me freaking out. Check out my blog for the news. Haha! Yeah… another tag! Well, ganun talaga… like or not, you’re IT! Looks delicious. Hat’s off to the master chef (the wife), mothers are my real heroes in life. BTW it tastes good with the mayo and banana ketchup, for me anyways. btw, how did your wifey cook it? pag ako kasi nagdidikit-dikit, then it gets all soggy. :p just like a murdered version of mojos. hehe! Hahaha…! Wait lemme ask the “master chef” herself… I’ll ask her to post her directions here in a bit… check back later to find out… hehehe! Uy! I love mojos ha! 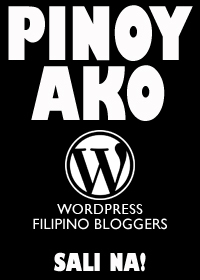 Kahit pa murdered version…! Mojos rock! Yum yum! « 8 Random Things About Me!